As you can see, happiness is decline with time period. Before sify broadband I had Dialup net connection that too using stolen dialup password but telephone bill used to drive me crazy. It was my dad’s suggestion to get some broadband connection after reading some advertisement about sify broadband. This is how I got sify broadband as my 1st ISP .I had started with unlimited 32 kbps net connection, even with 32 kbps I was lot happy since those days not many people use to have broadband connection and this was lan sharing one so net speed was awesome those days. Plus guys who had started Sify Broadband in my city had very less customer, so attention to customer problem was very high. 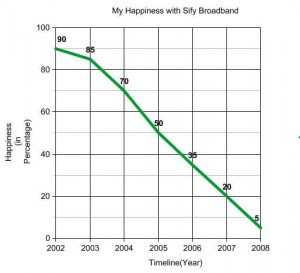 But as time passed things started getting worst with at the end it was horrible to keep sify broadband.